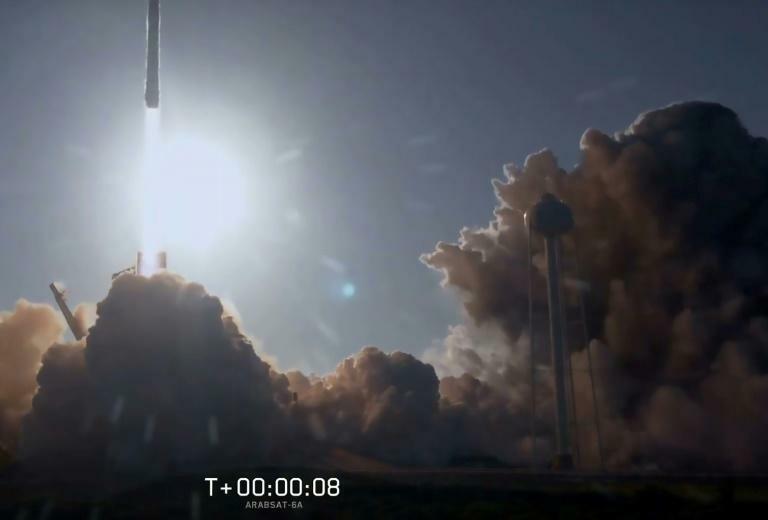 SpaceX carried out its first commercial launch on Thursday with its Falcon Heavy rocket tasked with placing a Saudi satellite in orbit. The bright white rocket rose with a mighty roar and spewed thick gray smoke on the ground as it made its way up into clear blue skies over Cape Canaveral, Florida. It trailed a long stream of bright orange fire. The rocket exerts 5.1 million pounds of thrust -- that of more than a dozen jetliners, SpaceX said. The rocket is to carry a Saudi Arabian satellite operated by Arabsat, a year after sending founder Elon Musk's red Tesla roadster into orbit as a test. The job is to place the six-ton Arabsat-6A satellite into geostationary orbit about 22,500 miles (36,000 kilometers) above the Earth. Two of them, as planned, landed safely back on pads at Cape Canaveral, to a roar of approval from the crowd. A third landed, also as planned, on a barge at sea.